Specialized Solar Systems popular entry-level 3kVA 6-8kWh off-grid solar system. Generating a daily average of 4kWhrs with a battery storage that supports 3kWhrs of daily electrical energy usage. 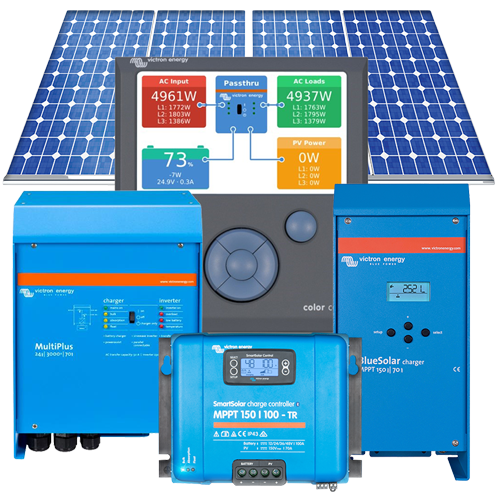 Our popular entry-level off-grid residential solar system designed by Specialized Solar Systems. Using superior quality solar components, this off-grid solar system will supply our customers with a daily average of 4kWhs of solar-generated energy electricity. It includes a battery storage capacity that supports 3kW hours of daily electrical energy usage directly from the battery before reaching a 27% Depth of discharge (DOD), therefore maximizing the batteries lifespan. Off-grid power systems supply electricity to properties that are not connected to the public electricity network. These renewable energy systems are essentially independent power stations capable of powering a wide range of applications with dependable and reliable electricity that is no different to that supplied by the national electricity grid. Whether it be a small or large new or existing home, a station, business or an entire community that depends on large diesel generators, off-grid stand-alone power systems are commonly the reliable, clean, hassle-free, cost-competitive answer! It is Specialized Solar Systems recommendation that energy saving principles are put into practice and taken into consideration before such a system is purchased i.e. low wattage lighting, gas stove/geyser etc. To have an average input of 4kWh/day from your solar modules in George, South Africa. You will need a solar module array of 750Watt. These solar modules have a 10year manufacturer’s product guarantee and a terrestrial 25year 80% yield. 530Amp 10-15year Lifespan, 2V Millennium Deep Cycle Batteries with interconnecting cables. These batteries will have the capacity in storage at 3kWh’s usage per day to cycle your system 24% maintaining system efficiency and battery lifespan, please note that actual cycle ratios may vary from installation to installation depending on system use. 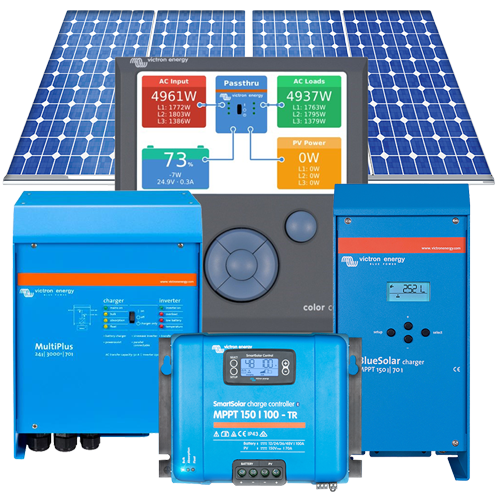 The Blue Solar charge controller will charge a lower nominal-voltage battery with a higher nominal voltage PV array. The controller will automatically adjust to 12 V, 24 V or 48 V nominal battery voltages(Software tool needed to select 36 V). If partial shading occurs, two or more maximum power points may be present on the power voltage curve. Full output current up to 40°C (104°F). Compensates absorption and float charge voltages for temperature. Compensates absorption and float charge voltages for temperature. The main output provides a powerful charge to the battery system by means of advanced ‘adaptive charge’ software. The software fine-tunes the three-stage automatic process to suit the condition of the battery and adds a fourth stage for long periods of float charging. The adaptive charge process is described in more detail on the Phoenix Charger datasheet and on our website, under Technical Information. In addition to this, the Multi Plus will charge a second battery using an independent trickle charge output intended for the main engine or generator starter battery (trickle charge output available on 12V and 24V models only).